Quick-witted comedy YouTuber, Daniel Thrasher released his first ever comedy album last month and shortly afterwards made a video about how he did it – on YouTube! 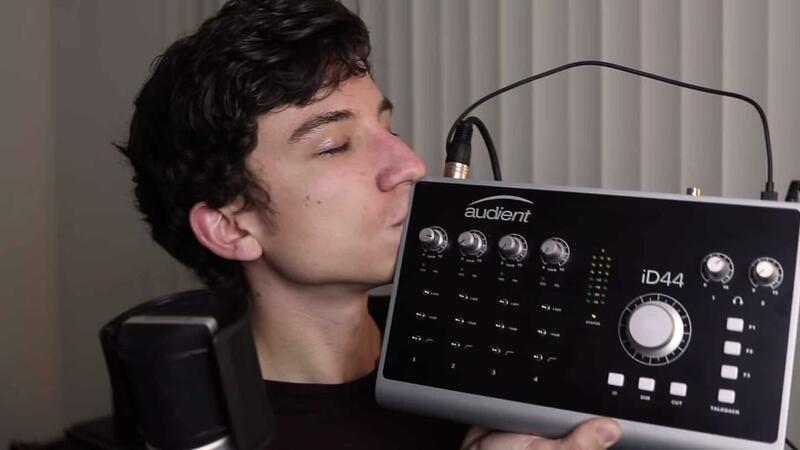 Audient is delighted to have been part of his signal path, in the form of USB audio interface, iD44 to which he attributes the “crystal clear sound” on the album, and on his more recent YouTube clips. I used to make video book reports with friends for English class in middle school and high school, and people laughed a lot at them so I took to the internet as soon as I could! Did a few videos on MySpace, then I started my YouTube channel in January 2007, so I’ve been on there longer than most popular YouTubers nowadays. Only started figuring out how to do things right a couple of years ago. As far as performing, I do have a BFA in Performing Arts and went to a magnet school for musical theatre before that, so I guess YouTube became the perfect place to showcase my strange ideas and skill sets. Quick & Sketchy is your brand new comedy album full of quick sketches [we like what you did there] recorded with the help of Audient iD44. Is this your first comedy album? This is my first comedy album! And it’s a quick one! I figured that there was a lack of audio sketches out there, so I wanted to design a comedy album with the intention to be listened to, not as a recording of a stage performance where I have to say, “And for those of you listening at home… I made a funny face.” Those jokes always feel like the listener is an afterthought. I also have this theory that audio sketches are about to get more popular. Adam Sandler did them back in the day, and I want to bring them to the present. Do you have anything to add as to how iD44 helped the recording experience? The iD44 was so easy to use, it really couldn’t have been simpler. A knob here for headphone volume, a knob there for mic input, a low-pass filter here, phantom power there. Couldn’t have been simpler – and it sounded so CLEAN! I couldn’t hear any noise at all and I was listening with some pretty stellar Sennheiser headphones too so I was looking for it! Lol. What are your favourite features? I think the low-pass filter is going to come in handy for livestreams with piano, so that way the vocals will be able to cut through with clarity. Also I can’t wait to get the hang of that digital knob so I can use it for easier panning/volume tracking, stuff like that! How has the reaction been to your album from the wider world? The reception has been pretty great! Lots of people want another one, because the first is an experiment so it’s closer to EP-length (7 tracks). I’m so used to immediate feedback (come up with a sketch, within the week I shoot it and upload it) – that after working on several audio tracks, listening to them over and over again with attention on sound design, it starts to lose it’s “funny” after the 4th week of hearing the same joke. Before it went live I questioned, “Is any of this funny anymore?” But, to my surprise, people have been messaging me with their favorite jokes, their favorite tracks, and people seem to like it! My personal favorite track was ‘Table Talk for the Soul’. It’s just a track of a guy chewing loudly for 30+ seconds. It’s sort of a troll on the listener, and reading the reactions to that track (from Audient’s own Harry, too, for instance) has been hilarious and satisfying. I’m so glad I kept it on the album. Congratulations on your YouTube 100,000 subscribers award! You are very prolific on YouTube. [Current subscriber count: 264,000] Have you used iD44 on any video clips? How does it help? Thank you! And I did! I’m starting to get more courageous with using sound design for sketches, so I used the iD44 exclusively for the vocals on ‘When a phone interrupts a concert pianist’ – which has over 165,000 views at the time of writing. I also plan on using it for my livestreams in the future, as well as any narration/Foley I have going on with both personal and professional projects to come. Do you record/make your own sound effects? Definitely. I use a lot of Foley to punch things up. ‘Table Talk for the Soul’ for instance, was a blend of fork/knife scratches I recorded in my homemade booth, as well as loud chewing, and then I threw in some other sounds from Soundsnap. But in a lot of sketches I record towel-snaps, clothing motion, stuff like that to dress up audio. I feel like I’m an audio-oriented person. If you have a well-lit video with bad audio, it’s unforgivable. But lousy lighting and great audio? It looks better somehow. How did you know how to do any of this? Do you have a recording background? I took a few classes in Sound Design from the Savannah College of Art and Design while studying performing arts. I almost made it my minor, actually! But I’ve also been playing piano since I was 7, so I’ve had a few run-ins with recording software. Could always learn more, though. What was your audio recording setup before iD44? My setup before the iD44 was a Samson G-Track USB microphone. That was literally it. For livestreams I would plug an auxiliary cable from my digital piano into the instrument input on the mic, then the USB from the mic into my computer, and people would get a strange, buzzy stereo sound where the piano track would be in one headphone, and the voice would be in another. Can’t wait to resolve that with the iD44 for my next livestream, not to mention how awesome it’s going to sound coupled with the Sennheiser MK4 I have paired with it. Sennheiser MK4 microphone, Audient iD44. I use Logic Pro X as my DAW, and I record music with my Yamaha Clavinova CVP 307. What would you tell a younger you just starting out on the road to YouTube stardom? I would tell my younger self to focus on making the JOKES great. It’s not about the person as much as it is about the material. Nobody wants to watch a guy trying to be wacky/funny for 10 minutes. They want jokes on a plate with the fat trimmed. So basically, plan better, and get as many jokes out as fast as you can. And get better at your title/thumbnail game. Also, don’t worry too much that the ‘How I Accidentally Wrote the Office Theme Song’ video hasn’t gotten many hits for the first 5 years. It’ll break 10 million once the algorithm changes. To be honest I’m most surprised/proud of the fact that I’ve surpassed some of my heroes in subscription count. Back in the day, Derrick Comedy and Balloonshop were my GO-TO YouTube channels. A lot of people don’t know this, but Derrick Comedy (Childish Gambino’s old sketch comedy channel) was the number 1 comedy channel on YouTube. Today, as I write this, I’ve just passed their subscriber count, and it’s really weird knowing how influential they were to me. It just makes it very real for me, I know that there’s probably someone out there who looks up to me and that is a tremendous responsibility. I know I just make dumb videos on the internet and it’s not that serious, but still. Donald Glover, Bo Burnham, Olan Rogers. In that order. They all have found a way to break the YouTube comedy mold and turn it into something real-world and awesome. As someone who lives in LA, that’s (hopefully!) going to be my next move. Audient can’t wait to see how things work out for you! Good luck with everything & thanks for the chat! To have a listen to Quick & Sketchy, find it on Apple Music, Spotify, Google Music.